As temperatures rise, cutthroat spawning wanes, grasses and other plants begin to dry, and elk calves become more capable of avoiding predation in summer months, many Greater Yellowstone grizzlies move to higher elevations in search of food. Army cutworm moths are an important food source for grizzly bears. 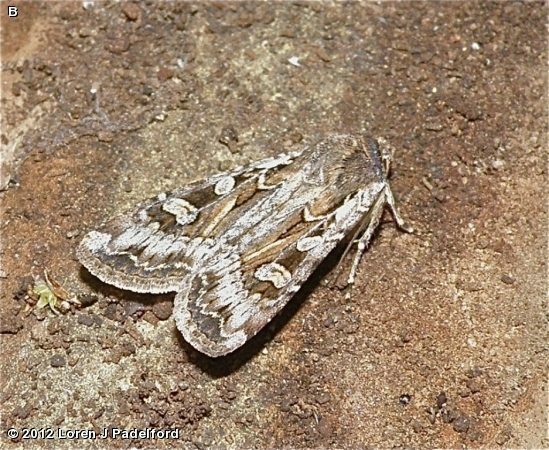 A key food source in mid – late summer is the army cutworm moth. It wasn’t until the late 1980s that the importance of moths in the Greater Yellowstone grizzly bear’s diet was widely recognized. Each year, many hundreds of thousands of moths migrate from lowlands as much as 300 miles east of the Yellowstone to feed on the nectar of alpine wildflowers high in the Rocky Mountains. They feed at night and rest during the day under rocks in large boulder fields, typically on steep, high mountain slopes. Scores of moths may gather under a single boulder─thousands in one boulder field─providing a nutrient-rich food source for predators. Grizzly bears search for army cutworm moths in summer months. 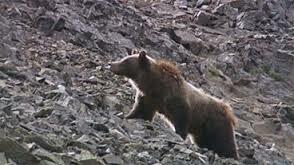 Both grizzly and black bears exploit this rich food source by combing through high mountain boulder fields, turning over rocks and scooping up dozens of moths at a time. A grizzly bear may eat more than 40,000 moths in a single day. Many grizzlies may tolerate one another in a single boulder field if the moths are plentiful. When grizzlies are present, however, black bears generally stick to the outer margins of the field, avoiding direct conflicts with the larger, more aggressive grizzlies. Some researchers have suggested that the habit of Greater Yellowstone grizzlies feeding on moths only became widespread beginning in the late 1980s in response to reduced availability of garbage dumps and other food sources. Army cutworm moths migrate back to the plains in late summer and early fall, where females lay their eggs in the soil. The caterpillars of the moths become agricultural pests in the spring before they pupate, emerge as adult moths, and migrate to the mountains. Caterpillars and moths are exposed to pesticides and agricultural fertilizers in plains croplands, but there is no current evidence that chemicals in the bodies of these moths pose an imminent threat to GYE grizzlies. Here is a grizzly looking for army cutworm moths.